Read here about tensegrity structures composed of sixty struts, part of a series of pages organized by strut count. 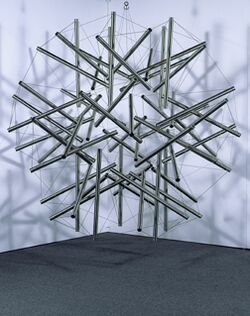 The structure consists of 20 three-strut tensegrity prisms in an icosahedral (having 20 faces) form. Commissioned by a Dayton, Ohio, bank, Fuller created the 500-pound, 9-foot-diameter sculpture in 1979. From the bank it traveled to the Dayton Art Museum, where it remained until workers renovating the museum disassembled the sculpture and stowed it in the basement. strut sculpture by R. B. Fuller, Sixty Strut Tensegrity Sphere. This page was last edited on 25 September 2018, at 09:51.